TORONTO, ONTARIO--(Marketwired - Oct. 27, 2016) - Darnley Bay Resources Limited (TSX VENTURE:DBL) ("Darnley Bay" or the "Company") is pleased to announce that it has received the results of a biogeochemical survey from its Clear Lake Zinc-Lead-Silver project in the Yukon Territory. The survey, completed on behalf of Darnley Bay by All-Terrane Mineral Exploration Services of Whitehorse, YT, was designed to determine if biogeochemistry could be a useful exploration tool for the project, which has glacial till cover. The survey consisted of two east-west lines, 200 metres apart, across the known Clear Lake mineralized zone. Both deep auger till samples and biogeochemistry samples, taken from the branch tips of immature White Spruce, were collected at a 50 metre station interval along the lines. The till samples and ashed vegetation samples were both analyzed for a suite of 36 elements using ICP-MS at Bureau Veritas in Richmond, British Columbia. 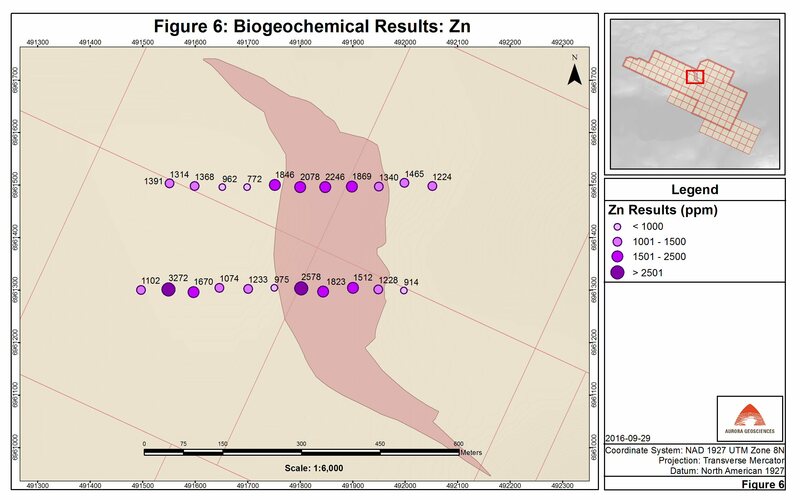 Analytical results indicate biogeochemical sampling is effective in the Clear Lake deposit area and that immature white spruce in this area show a strong preferential uptake of zinc and a more moderate affinity for barium and silver relative to a more subdued response from till samples (See Figure 1 and Figure 2). Biogeochemical sampling appears to be a significantly more accurate and robust tool than till sampling for identification of the surface expression of the Clear Lake deposit. This suggests that biogeochemical sampling could be useful to use in conjunction with other exploration methods to locate and define drilling targets at Clear Lake. Darnley Bay has also recently undertaken a compilation of historic Clear Lake property data into a comprehensive ArcGIS database. This work, completed by Jaworski Mapping & GIS of Surrey, BC, has resulted in the identification of an area of geophysical anomalies that has not undergone follow-up exploration. The new target area lies approximately 600 metres to the south east of Clear Lake deposits, underlain by Earn Group rocks and possibly by the same horizon as the Clear Lake deposit (see Figure 3). The area has coincident gravity and EM anomalies. In particular, the anomalous gravity survey signature is of the same intensity as that of the Clear Lake deposit defined in the same survey. This newly identified drill target is in addition to three other target areas identified as a result of geophysical surveys conducted in 2008-2009 by a previous operator. These consisted of helicopter-borne VTEM and magnetic surveys, followed by a program of surface induced polarization (IP) and gravity surveys. Analysis by Condor Consulting Inc. and Aurora Geosciences Ltd. revealed coincident/complementary gravity, electromagnetic (EM) and IP anomalies in these areas, characterized as possible massive sulphide bodies with similarities to the Clear Lake deposit. No field work, other than the biogeochemical sampling program discussed above, has been conducted on the property since that time and therefore these targets remain untested. "The confirmation that biogeochemical sampling at Clear Lake is a robust exploration tool should serve to uncover and refine additional drill targets on the property in a very cost-effective manner," said Jamie Levy, President of the Company. "We are excited by the additional geological/geophysical target located through the compilation of historical data. The Company plans a comprehensive sampling program in 2017 prior to drilling the most promising targets." The Clear Lake project, consisting of 121 contiguous claims covering approximately 2,479 hectares, is located 65 km east of Pelly Crossing, 90 km northeast of Carmacks and 225 km north of Whitehorse. A dirt airstrip approximately 1,000 metres long was used during previous drilling programs but is now overgrown. Past exploration was serviced by a winter road linking the property to the all-weather North Klondike Highway at Pelly Crossing, approximately 65 km to the west. Clear Lake is a SEDEX-style massive sulphide deposit occurring in Devonian to Mississippian-aged Earn Group fine clastic rocks. Extensive exploration work by several operators since the 1970's included 18,219 metres of diamond drilling in 71 holes and has defined three elongate-shaped lenses, 5 to 30 m thick and 450 m in length that extend at least 300 m down dip. Potential remains for resource expansion of these zones at depth and to the east. 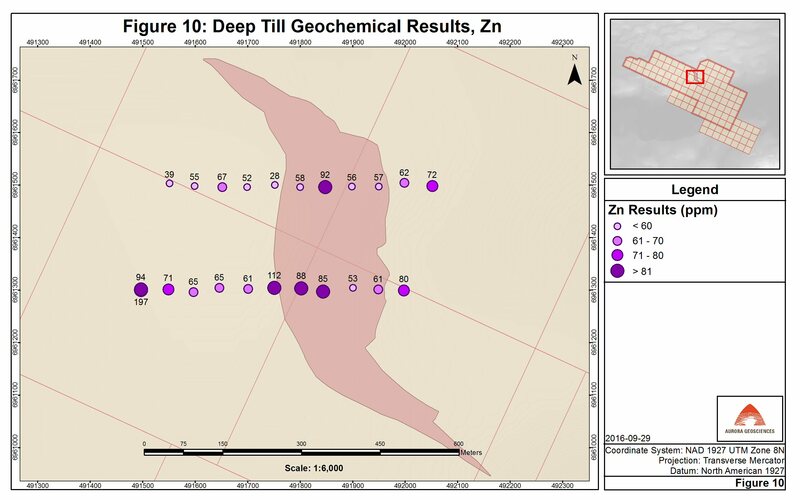 The Yukon Geological Survey database reports a "geological reserve" of 5,570,114 tonnes grading 11.4% zinc (Zn), 2.0% lead (Pb) and 38.01 grams of silver (Ag) per tonne. This historical estimate, prepared by D. Hawke of Getty Resources, used a sectional polygonal method, based on a minimum mining width of 4.57 metres and reported at a 7% Pb+Zn cutoff. Polygons were extended halfway to adjacent drill holes and 60.96 metres in open down dip or on-strike directions. A tonnage factor of 4.05 tonnes per cubic metre was used. Note that the stated category for this estimate does not conform to CIM and National Instrument 43-101 ("NI43-101"). A Qualified Person has not done sufficient work to classify this historical estimate as a current mineral resource. The Company is not treating the historical estimate as a current mineral resource. In 2010, a previous operator contracted SRK Consulting Canada Ltd. to prepare a report, including an updated resource estimate in accordance with CIM and NI43-101. The estimate utilized a 3D Gemcom block model with grades interpolated using ordinary kriging within a 5% Pb+Zn grade shell and used a tonnage factor of 4.07 tonnes per cubic metre. On this basis and using a 4% Pb+Zn cutoff, an inferred mineral resource of 7.65 million tonnes grading 7.65% Zn, 1.08% Pb and 22 g/t Ag, based upon 63 drill holes totaling 13,168 metres of drilling, was reported. This is a historical estimate and a Qualified Person has not done sufficient work to classify this historical estimate as a current mineral resource. The Company is not treating the historical estimate as a current mineral resource. Darnley Bay Resources Limited has a strategy to acquire base metal projects at or near the feasibility stage and advance them towards production. Currently the project portfolio includes the Davidson molybdenum deposit near Smithers, BC, the Clear Lake zinc-lead project in the central Yukon, and the Darnley Bay gravity anomaly located on the Arctic coast near the Town of Paulatuk, Northwest Territories. Additionally on October 23rd, 2016, Darnley Bay entered into a binding letter of intent to purchase the Pine Point lead-zinc property, a major past producer located 42 kilometers east of Hay River, NT. All samples were collected by experienced geologists and technicians and shipped to Bureau Veritas facility in Whitehorse, YT. Till samples were prepared in Whitehorse, while vegetation samples were prepared in Richmond, BC, where all samples underwent multi-element ICP analysis. Carl Schulze, BSc, PGeo, President of All-Terrane Mineral Exploration Services, Qualified Person under NI 43-101, reviewed and approved the scientific and technical information presented in this press release.